Healthcare organizations have significantly more to consider than the average business when it comes to network and device security. Concern over code modification, key compromise, password-based vulnerabilities and man-in-the-middle attacks have caused hospital CIOs and CISOs to rethink their security strategies and investments. The threat to these devices has even been assigned its own term: medjacking, a shortened form of “medical device hijacking. 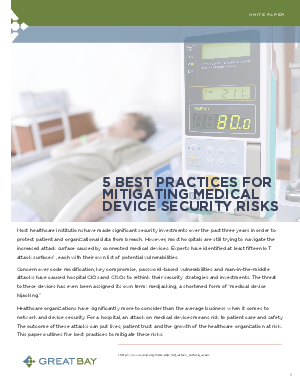 Download this white paper for five best practices to mitigate threats and attacks that can put lives, patient trust and the growth of your healthcare organization at risk. Access the white paper today! * Please enter your email address and click the Download Now button to download the white paper.